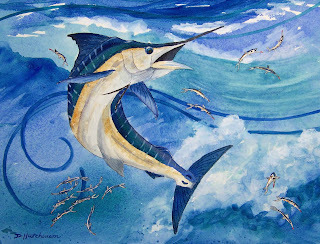 Today I painted a design for a client who requested a blue marlin and some ballyhoo for an area above his cook top. This is how I start the tile making process. I make a color sketch to get ideas and to plan what colors to use. This painting is aprox. 16" X 20". I don't usually paint this large but I liked the drawing and thought if it came out will I could frame it. It did I think. Wow!!! That painting looks awesome!